The high political level was also reproduced in the many sporadically organised meetings and discussions that took place throughout the week in the evenings after the official sessions. This showed the very serious attitude of all comrades to the tasks that are posed to the Marxists in the next period. We publish below, a report from the World School written by a British comrade who was attending such an international Marxist event for the first time. The report gives a vivid description of the quality of the political discussions at the event, as well as of the enthusiasm with which the Marxists are fighting for socialist ideas across the world. After arriving into Athens’s last functioning international airport (the other is now closed due to the country’s capitalist economy being in its death throes) and a quick taxi ride, I went on a brief exploration around my final destination – a hotel by the coast. But what’s this? Lots of people from various nationalities relaxing, having also just arrived, reading books with titles such as “State and Revolution” and “Ted Grant: The Permanent Revolutionary”. This was no holiday - it was the beginning of the best and most intense political event I’ve ever been to: the 2013 World School of the International Marxist Tendency! The school started the following day with a discussion on perspectives for the world revolution, with Alan Woods – editor of www.marxist.com – introducing the discussion on the international situation and the global crisis of capitalism. Alan’s introduction had a tremendously broad sweep, discussing how the bourgeoisie around the world are unable to extricate themselves from this mess precisely because the tools they would normally use to get out of a slump (credit, Keynesian stimulus, etc.) have already been exhausted during the boom! Alan and other speakers noted how consciousness can suddenly leap forward with a bang, with revolutionary explosions being seen even in countries such as Turkey and Brazil, which were assumed to be economically growing and politically stable. However, in an irony of history, which Alan described as “political necrophilia”, the leaders of the labour movement are clinging to the cadaver of capitalism just as its failure becomes most glaring! In Greece, 29 general strikes have been called in the recent period but yet they have achieved nothing. The ruling class have given nothing in terms of reforms - because the cupboards are bare! In this respect, as the Marxists have repeated so often, the crisis of humanity can be reduced to a crisis of the leadership of the working class. It is the task of Marxists to build a mass revolutionary organisation that can offer an alternative and lead humanity out of this morass of capitalist decay. The session on world perspectives was one of many excellent chances to hear the contributions of Marxists from across the world, with speakers from Indonesia to Canada; from Pakistan to Venezuela. Now, more than ever, the struggles against capitalism have taken on a global character, with mass movements breaking out everywhere in response to a worldwide crisis. Marxists, therefore, must be organised internationally to tie these various struggles together and fight for international socialism. In particular, there was an inspiring session on the building of the forces of Marxism in Pakistan, introduced by comrade Lal Khan – editor of the Asian Marxist Review. If we sometimes get a bit down and think we have difficulties in Britain, we should spare a thought for our comrades in Pakistan! There are four proxy wars going on in Pakistan; 967 children were killed last year alone in Waziristan/Swat/Pashtoonkhwa. Marxists in Pakistan are daily under attack by the security services and fundamentalists. Fatwahs have been issued against Marxists by the Taliban; many have been killed in the sectarian terror in Balochistan. Whilst all we hear about Pakistan is corruption, fundamentalism, terrorism and barbarism, there is another unreported Pakistan: that of the poor and working people who have a revolutionary tradition. It is under these harsh conditions that the forces of Marxism are being – very successfully – built in Pakistan, and the Marxists are leading a number of important struggles, particularly amongst the doctors. It was emphasised my many speakers that events are moving at lightning speed. As if to prove this point, the day prior to the session on the Arab Revolution – introduced by Hamid Alizadeh - a second revolutionary wave had begun to unfold in Tunisia. At 1pm the previous day, leftist leader Mohamed Brahmi was gunned down. Spontaneously thousands went into the streets and fights broke out with the police. In a short time workers were flooding the UGTT (trade union federation) offices and a general strike had been called. It was noted in a number of contributions that, across the region, we are seeing a second phase of the Arab Revolution that is shaking political Islam down to its foundations in Egypt, Tunisia and Turkey. We can expect that other countries that seem outwardly stable will also be shaken by revolutionary convulsions in the near period, including Saudi Arabia, where 40% of the native population live in poverty. The recent movement in Egypt, during which 17 million people were on the street, has to rank as one of the biggest mass movements in history. The Tamarod (“Rebel”) movement had power in its hands, but at this stage was unconscious of the fact and gave this power back over to the military generals and the liberals, such as El Baradei, who have no roots in the movement. To make that which is currently unconscious conscious: this is the role of the Marxists. Comrades from Greece spoke about the developments in their own country. Europe has become something of the front line in the world crisis of capitalism in the current period, with the crisis hitting the southern European “PIIGS” (Portugal, Ireland, Italy, Greece, and Spain) particularly hard. Greece is arguably in the most acute situation and we would go so far as to describe the situation as pre-revolutionary. To offer a few facts: 30% are unemployed; 4 million out of 11 million are now living in poverty; since the beginning of the crisis, life expectancy has dropped by 7-8 years. Meanwhile the national debt is out of control, representing 175% of GDP. Of the 219bn Euros borrowed from the Troika, more than half has been used to reimburse the parasitic holders of Greek bonds. Greece is approaching closer and closer to out and out bankruptcy, which will be but a prelude to its ejection from the eurozone and a further spiralling of the crisis. It is in this context that all of the mainstream parties have been collapsing in the polls. Meanwhile, there has been a shift to the right in the leadership of the SYRIZA party, which comes from a communist tradition. The Marxists in SYRIZA, organised as “The Communist Tendency of SYRIZA”, have been opposing this shift, presenting an alternative document at the recent SYRIZA conference and gaining two seats on the SYRIZA Central Committee. In the coming period we can expect SYRIZA to come to power and, if the leadership betray the base, we can expect a mass audience to open up to ideas of Marxism. The task in Greece, as in all countries, is to urgently build the forces of Marxism and educate ourselves so that we can effectively intervene in the revolutionary events that we anticipate will unfold in the coming period. The school itself was dedicated to the memory of Ted Grant, who would have celebrated his centenergy this year. Alan Woods introduced a session on the life and ideas of Ted. He outlined how, unlike other groups, the IMT does not imagine that history begins with us. The Marxist tendency has a long tradition that goes back to the writing of the Communist Manifesto itself. Alan explained how Ted not only preserved that tradition against the ideas of reformism and Stalinism in the difficult post-war period, but also enriched that tradition, with contributions on the revolutions in the ex-colonial countries, on the nature of the Soviet Union and the regimes in Eastern Europe, and on the question of how Marxists should relate to the mass organisations of the labour movement. Indeed, many of the later sessions at the school were on the contributions made by Ted Grant towards the ideas of Marxism. 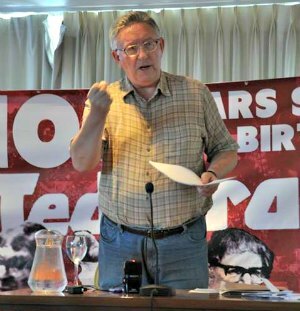 Alan then outlined how the Militant Tendency, which was the biggest Trotskyist group since the Left Opposition in Russia, was built on the foundation of these ideas, but how this was also destroyed when the ideas and traditions were abandoned. I’m a relatively new comrade to the tendency and can say that I was first attracted to the IMT by the focus on scientific socialist theory; so I was very pleased to be able to participate in a series of discussions on a range of topics, including many on matters of Marxist theory. Why does capitalism go into crisis? What is the Marxist analysis of the State? What is the solution to fighting against women’s oppression and for full emancipation? All of these questions, and many more, were discussed in depth in sessions during the week. In particular, the session on women’s oppression and liberation was one of the best sessions, both in terms of the quality of the lead off - by Marie Frederiksen of the Danish Marxists Socialistisk Standpunkt - and also in terms of the quality of the contributions, the majority of which came from young female Marxists from across the International. Marxists don't focus on class because class oppression is the worst or most horrible form of oppression, but because it's only through the class struggle that society can be transformed and all oppression abolished. After Chávez’s death, the situation in Venezuela is changing fast and lots of different things are happening at the same time; there are lots of unknowns and a lot of uncertainty. Trying to build the forces of Marxism in Venezuela at the present moment is like trying to build a house in the middle of a hurricane! The school brings together the experiences of comrades from across the world, and we take home advice and suggestions that make us stronger. This not only happens through the talks and the discussions, but also through informal conversations with the comrades. The role of a revolutionary international is as a collective memory that teaches us how to solve problems and avoid errors that might have been previously committed by others. In this sense, we believe that we the Venezuelan comrades have a lot to contribute, since Venezuela is in the midst of a revolution. The similarities between the problems we face became visible, for example, in the discussion about the women question, where, despite the different experiences of the different comrades, one could appreciate a recurrent theme. I wanted to talk about the GOTCHA textile factory, in the state of Aragua in Venezuela, which has been occupied and managed by its workers for four years now, who are mostly women. The textile industry in this region has traditionally been based on the exploitation of female seamstresses, who do 12 or 15 hours a day of piecework. With the takeover of GOTCHA, the capitalists in the region were forced to improve the conditions in their factories to avoid new occupations. Similarly, the bureaucracy, who fears occupations and workers management, put pressure on the local factory owners to agree to the workers’ demands to prevent the problem from spreading. Here we see how closely interconnected the women’s struggle is with the working class struggle. There were many other unforgettable contributions during the school. One of these was Alan Woods talking about his daring attempts to build the forces of Marxism in Spain, working underground for threat of being found by the oppressive machinery of the Franco dictatorship. The forces of Marxism, however, were built rapidly in a short space of time, despite the difficult conditions, showing that there are really very few places that the ideas of Marx, Engels, Lenin and Trotsky, propelled by the correct perspectives and flexible tactics, can’t penetrate. As usual, the international event ended with a party on the final evening, with revolutionary songs from across the world sung by the comrades from different countries, and, of course, a rousing rendition of the Internationale. It was wonderful that the school was held in the memory of Ted Grant, to celebrate his centenary. When speaking to some of the older comrades who were lucky enough to have known Ted, it was clear that he always had an interest in educating the youth and turning them into the future leaders of the world revolution. I can only speak for myself, but I truly feel that the world school has greatly increased my confidence in the ideas of Marxism and helped prepare me more for the tremendous revolutionary events that lie ahead in Britain and internationally.